Scott Dobson achieved his first win at the triple-A level at last week's 1000 Islands Northern FLW Series. Former FLW Tour pro Scott Dobson got away from top-level fishing several years ago in order to spend more time with his young son. Much of that bonding time has been spent on the water, and some of those excursions have been quite profitable for Scott Jr., who's now 10. 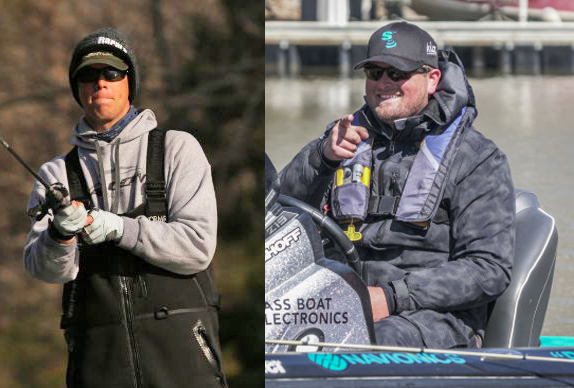 "We fish team tournaments and I pay the entry fee, but then he insists on keeping all the money we win," Dobson said. "Hey, if it keeps him interested, I've got no problem with it." The senior Dobson recouped all of the loot he's let his son pocket � and then some � when he won last week's 1000 Islands Northern FLW Series out of Clayton, N.Y. The haul for the biggest victory of the 43-year-old's career was in excess of $82,000. "I'd knocked on the door quite a few times at this level and on the Tour, but I wasn't able to close the deal," said Dobson, who's served as the VP of operations for a cable contracting company for the past 17 years. "I wouldn't say this was easy, but I made the right decisions and things came together. "When I finally held up that trophy, that's when I felt like it was over." 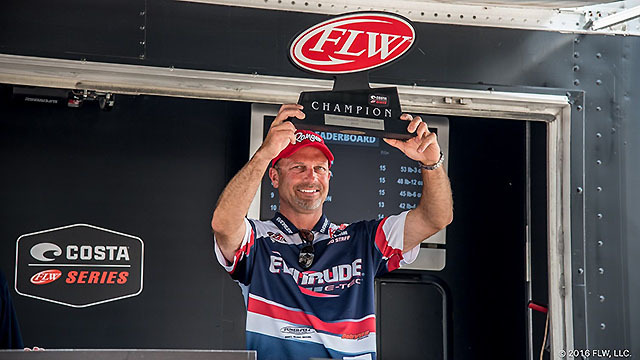 It was a tournament he almost didn't attend due to mechanical issues he incurred en route to an 8th-place finish in a BFL on his home waters (Lake St. Clair) just a few days earlier. He ended up borrowing the big-water friendly Ranger 620FS owned by his travel partner, Brian Doyle, and some of the boat's features paid dividends against the powerful winds that the 137-angler field encountered during the event. The 1000 Islands are about an 8-hour drive from Dobson's home in Clarkston, Mich. He'd competed in triple-A derbies there twice before, but his most recent visit was more than a decade ago. In 2001, he caught 18-pound stringers on each of the first 2 days to lead at the midway point (the tournaments were 4 days back then), but managed just a single 2 3/4-pounder on day 3 and plummeted out of the second cut. That derby took place during the same calendar week as this year's event. "I was a much younger person then and not as smart," he said. "I ran out to the area I'd been fishing, which was just outside (the St. Lawrence River on Lake Ontario), and it'd gotten completely blown out by the east wind. "The water temperature had dropped 10 degrees and the fish just vanished overnight. I went from hero to zero real fast." He put in 2 1/2 days of practice for this year's event. He initially launched into the lake at Henderson Bay, but couldn't accomplish anything due to the fierce wind. He relocated to the river and quickly found a scenario to his liking. "We got behind an island that was somewhat protected and it reminded me a lot of the St. Clair flats," he said. "Twenty minutes after I shut down I started seeing stuff that I like to do on St. Clair. "It seems strange to say it was basically a shallow pattern because it worked from 4 or 5 feet (of water) all the way out to 20 feet. It was somewhat flat-related, or maybe the first break off the flat. The big key was you had to get away from the mossy bottom, which is a pretty well-known deal." He focused on places where the substrate was sand or gravelly rock. Many of the places featured sand grass, which only grows to a few inches off the bottom. He assumed that the fish he caught were post-spawners that were hanging out and feeding up on the clean-bottom areas. His locales were oriented at least somewhat toward the west, where some sort of current was a constant presence. He estimated that he looked at 80 percent of the fish he caught before making his first cast to them. A dropshot rig enticed the majority of the fish he caught during the event, including the biggest ones, but he also employed a tube, a Ned rig and a Duo Realis Spinbait 90. Dobson's 24-09 stringer on day 1 was the biggest of the event and it was anchored by a bronzeback that was just an ounce shy of 6 pounds. That was his first fish of the day, and it came from a river location. "That one blew my mind," he said. "I saw some other fish there, but they weren't biting. After that I ran out to an island in the lake and finished my limit and culled a couple of times. It was rough out there and I wanted to go back and take another look in the river, and on my first cast in there I caught another 5 1/2." He fished that place for awhile longer without success, then relocated to a flat. "They were everywhere in there and I made two more big culls. When I looked in my livewell, I knew I had what was pretty much a super-sack and it was time to head back to the ramp." He boosted his lead from 1 1/2 pounds to 5 on day 2 with a 22-03 bag. The lake was put off-limits that day due to the violent wind and he assumed his river stuff would get crowded, but that didn't transpire. "I was really kind of paranoid about it, but I didn't have any company. A couple of people came in and out, but that was it." The lake was back in play for day 3, but Dobson quickly dismissed any notions he might've had about fishing it. "With a lead like I had, it didn't make sense to run 18 miles out into the lake to an island when I could catch 20 pounds in the river, 15 miles from the boat ramp." His final-day haul was almost 2 pounds better than that and he outdistanced runner-up Chris Johnston by more than 7 pounds. > Dropshot gear: 7'4" medium-light Dobyns Champion Extreme (for short casts) or 7' medium-light Dobyns Champion (longer casts) rod, Shimano Stradic CI4+ spinning reel, 10-pound Sunline FX2 braided line (main line), 8-pound Sunline Super FC Sniper fluorocarbon (8' leader), 1/4-, 3/8- or 1/2-ounce Provider Tackle cylindrical dropshot weights, No. 1 or 1/0 Gamakatsu Split Shot/Drop Shot hook, various Berkley soft-plastics (Gulp! Fry, PowerBait Minnow or PowerBait Pro Twitchtail Minnow in green-pumpkin, watermelon pearl or shad pearl). > He used the same rod, reel and line set-up with the tube and Ned rig, both attached to Provider Tackle jigheads (1/4-, 3/8- or 1/2 ounce, depending on wind). 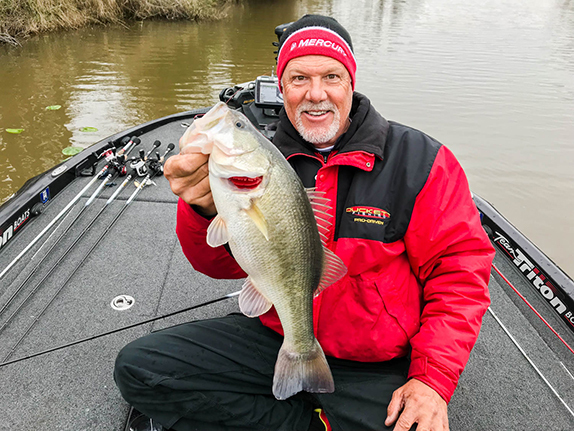 The tube was a 4" Provider Tackle Performance Series model in a color that company owner Art Ferguson, himself a former FLW Tour pro, calls Mardi Gras. > The Ranger 625 that he used was equipped with a Minn Kota Ulterra trolling motor, and the Spot-Lock feature was a huge advantage for him. 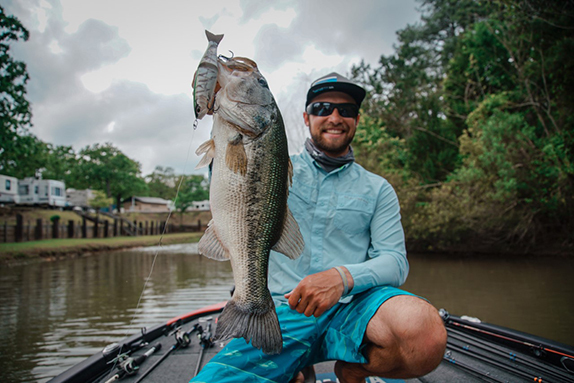 "It allowed me to keep both feet on the deck in that rough water and gave me the freedom to walk around the boat without worrying about the trolling motor." > Dobson hopes to return to the Tour level when Scott Jr. gets a bit older. "That's definitely not out of sight," he said. "There'll come a point in time when it's back on the radar." The following anglers did not make the cut and did not fish on day 3.